According to the philosopher Gaston Bachelard, 'the miniscule, a narrow gate, opens up an entire world.' In the case of Sarah Woodfine Bachelard’s maxim is entirely apt. 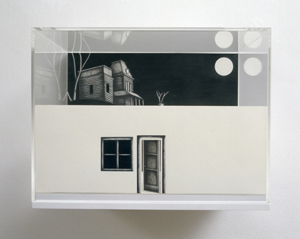 Woodfine’s drawings, often contained within specially constructed structures that act both as frames and as physical extensions of the drawing itself, operate as miniature worlds, self-contained systems through which a series of vignettes are staged for the viewer’s careful consideration. The deceptive, intense surface of Woodfine’s drawings is one point of attraction; a second stage of intensification and of bringing into focus is enacted by Woodfine’s elaborate framing. One may therefore regard these ambivalent drawing-objects as a bi-part lens through which one may view a corner, fragment or snapshot of another universe. The environment presented may be regarded as a translation or transformation of selected aspects of the world we frequently take for granted. Woodfine’s practice involves the directing attention, of looking and causing the viewer to look in an active, highly interested and consistently insistent way. The subject matter Woodfine employs is itself idiosyncratic, separated out, a sort of parallel sphere of action ghosting that of the mundane and the deadly dull. Reconfigured church architecture, fairy tale castles, out-of-date caravans, desert islands and children’s dolls: such material is at one remove from ordinary life, closer to the realm of childhood and fantasy than to our allegedly adult, high-tech, highly mobile social sphere. Woodfine’s images touch 'a nerve of memory and nostalgia' (in Colin Wilson’s expression), something that is decidedly other, still present yet no longer easily seen. Perhaps a better word for this invisibility would be 'discarded' or even 'repressed'. 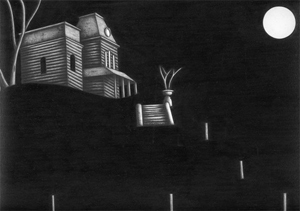 What is brought to the surface in Woodfine’s work may appear unreal or imaginary but the issues triggered by her stark black and white drawings are never simply entertaining or bluntly childish. Untitled (Castle) (2005) presents two views of an immense fairy tale castle but the building’s half-cheery facade is itself both inviting and mildly repulsive, its apparent serenity edging into mystery and threat. The steps leading to the open doorway imply that one has no choice but to enter therein. The glittering ground of the container in which the drawing is placed stops abruptly at the edge of the castle, a move from three dimensions into two, from the real into the false but seductive setting of a gateway into an unknown interior. Fairy tale castles are places of captivity and uncertainty as much as they are dream-palaces or utopias: once inside it is quite possible that one may never be able to escape. Similarly, Island (2006) shows the stereotypical palm tree and ditched boat of a tropical but isolated island, a mythological micro-environment within which one may again be trapped or, conversely, freed from the humdrum hell of the modern metropolis. It is an image of an idealised state, a compacted packet of meanings, gestures and suggestions, something akin to a philosophical conundrum or puzzle. To choose such pseudo-archetypical imagery is, from the start, to pose a question and to activate an act of complicity or critique. As already noted, Woodfine has in these works juxtaposed two images, a second drawing placed back-to-back with the first. From the other side of the glass can be seen the rear of the castle. It is the same with Island, although in this case an image of skeletal remains convey an unequivocally negativity tint. 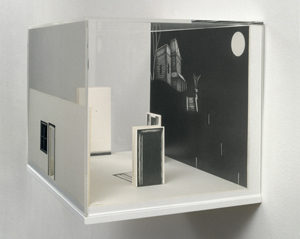 It is in fact misleading to describe Untitled (Castle) and Island as 'mere' double drawings, since both works involve a complicated frame in the form of a large Perspex dome and accompanying base, vastly enlarged versions of those playful Christmas devices known as 'snow-domes', small plastic or glass bubbles in which is placed a model city, building or scene. Such structures are miniatures of real or imagined life-size dwellings or events; but Woodfine has, rather paradoxically, enlarged these dream spheres, causing a disruption and redesignation of scale. Further, the three-dimensionality of the domes are effectively in competition with the flatness of the drawings, forcing another instance of refocusing to take place as part of one’s engagement with these works. 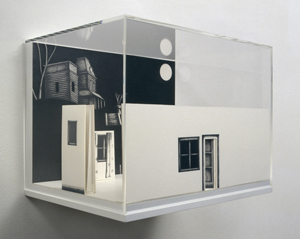 In The Garden (2005) Woodfine presents the viewer with yet another visually provocative object, a three dimensional model assembled from a number of drawings, arranged to form a coherent rendition of a garden. By the simple but clever device of placing an open doorway at one end of the piece Woodfine suggests that there cannot be one single, 'true' point from which to look at this (or indeed any) of her works. In the garden we see a latrine, a couple of trees and a theatrical arch, behind which floats a ghost. Simultaneously laid out here is an exterior and an interior scenario; what is in one viewing obscured is, in a second act of looking brought directly into play. This revelatory moment of showing stages its own conditions of visibility, reminding us that we often only see what someone has deliberately encouraged us to perceive. Of the several strands of illusion evident in Woodfine’s work it is easy to overlook what is in a sense the most obvious one: that of drawing itself. Although emphatically two-dimensional Woodfine’s drawings have the marked intensity of etching and utilise a refined, repetitious technique notably associated with painting and sculpture. As she herself has observed, many viewers of her work assume that what they are looking at are prints. This dialectic between drawing and other media in the work of Sarah Woodfine is itself deserving of extensive critical attention, a task regrettably beyond the confines of the present, essentially introductory account. 1. Gaston Bachelard, The Poetics of Space, Beacon Press, 1969, p. 155. 2. Colin Wilson, The Black Room, Weidenfeld and Nicolson, 1971, p.163. 3. For a discussion of the importance of the frame and what it contains or enables see Jacques Derrida, The Truth in Painting, University of Chicago Press, 1987, especially chapter 1, 'Parergon'. According to Celeste Olalquiaga, the first recorded appearance of the snow-dome was at the Exposition Universelle, Paris, in 1878. See her The Artificial Kingdom, Bloomsbury, 1999, p. 62. Peter Suchin is a critic and artist. His writings have been published in a wide range of contemporary art journals including Art Monthly, Art Press, Frieze, Untitled and Mute. The Grey Planets, an exhibition of Suchin’s paintings, will be at Gold Factory, Nottingham during September/October 2006.